The fresh water streams, or sweet drinking waters, were known to the Khoena as ‘Camissa’ – //ammi ssa. The term //ammis, gammis, kamis or khamma is the root for ‘Camissa’ and can be found in the Nama language and the Khoemana language. It is also the term for any fresh-water river. The river in Table Bay is noted by the Portuguese as ‘Aguada de Saldanha’ (water of Saldanha – the original Portuguese name for Table Bay) while the Dutch similarly later named this same river as the Soetwater Rivieren (Sweetwater) and referred to it in documents as Fresh Water, as distinguished from Zouten Rivieren (Salt River). The Khoena did not have affectionate or honorary names as in the European tradition. Words used were utilitarian and simply descriptive or for verbal route-mapping. Governor-General van Goens in 1682 notes that the inland Khoena refer to a fresh-water river as ‘Camissa’ or ‘Cumissa’. The indigene name KAMMA, pops up elsewhere, meaning the same thing – fresh water. For example – Tsistsikamma = tse-tsesa + kamma means ‘clear water’, ‘place of much water’ or ‘place where water begins’. For a long time there has been an unbalanced approach to recalling the past in which the indigene experience has been but a footnote in an otherwise European dominated narrative. Even the critical view of many European commentators of the time tended to be marginalised. Effectively, the indigenes are presented as incidental to the founding of the port settlement of Cape Town and presented as playing no significant part in its founding. Indeed, not only were the Dutch responsible for dispossessing them of their land and livelihoods, but indigene people also found themselves robbed of their history as the true founders of the modern so-called Mother City of South Africa. In order to more accurately reflect the historical narrative, a combination of the perspectives and experiences of both sides of the ‘shoreline frontier’, is required. As there is no written indigene record, there is a greater onus to examine overlooked texts; the omissions, contradictions, obvious embellishments, and ideological overlay in the records of the time. We need to listen carefully to the voices raised in opposition among the indigenes at the time, despite being recorded by the beneficiaries of the dispossession. Much amplification is given to the many traveller texts and to Jan van Riebeeck’s narrative. These are quite disparaging of the indigenes of Table Bay. They refer to the Khoena as temporal inhabitants, dirty, smelly, lazy, good-for-nothing thieves and scavengers, unaware of the broader world beyond their shores. They are likened to beasts. This unfortunate view is deeply embedded in the minds of scholars and of South Africans in general. However, there are other accounts of seafarers and scribes which tell a different story of an enterprising and helpful indigene people, some of whom had travelled abroad. These tell of trading and port operations in a busy bay that precede the arrival of Jan van Riebeeck by at least fifty-two years and effectively constituted a settled proto-port trading community. Even the more balanced historical accounts present the Goringhaicona community, as being drifters and outcasts from other clans, a kind of mystery phenomenon without ‘joining the dots’ between increased shipping and its impacts on indigene modes of living and economy. Entrepreneurship is simply brushed off as opportunism, scavenging and begging practices by primitives. Also deeply embedded in social history enquiry is the notion that the Cape’s mixed ancestral heritage starts in 1652. The circumstances of the fifty-two years prior to van Riebeeck’s arrival, and the dynamics of other port settlements globally, suggest otherwise. Further consideration of the first fifty-two years of the 17th century is that it offers an alternative version of the foundation of the port, the city of Cape Town and its people. This provides a positive and non-racial ‘heritage anchor’ for those labelled ‘Coloured’ and indeed all who cherish what can be referred to as the ‘Camissa footprint’. With regard to persons of mixed parentage pre-1652, passing scribes, Tavernier and Mundy, make clear references to indigene children who they describe as “white and beautiful” with African and European features, and “… well-favoured as it could not be expected in such a place”. Van Riebeeck also refers to Oedasoa’s daughter as “a pretty, well-shaped girl, no darker than a fairly white mestizo” . The accounts show that Europeans consistently spent lengthy stays at Table Bay from as early as 1601 during which time they interacted extensively with the indigenes. Stayovers could be anything from a week to 9 months. Of the 2 632 ships that called at the Cape, involving five nationalities, 1 071 ships dropped anchor in Table Bay between 1600 and 1652. Some 200 000 Europeans passed through Table Bay in the period between 1600 and 1652. This would have caused a huge impact. What changed in 1652 was simply the permanence of European abode, development intent, and the dislodging of the early indigene foundations of a settlement and their proto-port economy. Therefore, contact with and impacts on indigenes at the Cape prior to 1652 must have been much greater than many historical accounts project. Also not examined is the impact on the Cape indigenes of being confronted with slavery on the ships and the correlation of slavery and colour. There has been a quiet assumption that the Khoena only came across the institution of slavery after the permanent European settlement. Recent research provides enough indicators that the Cape indigenes encountered slaves and slave-trading long before 1652. The operations of the VOC and English East India company had slavery at their core and this was instrumental in the shaping of Indian Ocean societies. Slaves passed from the Indian Ocean westwards and from the Atlantic Ocean eastwards. The Portuguese took slaves to Portugal from West Africa as early as 1435 and Indian slaves in 1510. The British took slaves to St Helena from 1628 and the Dutch were taking African slaves to Southeast Asia from 1623. The impact of periodic European presence and their ways changed the way of life, cyclical herding and economy of the indigenes. The Indigenes permanent presence at the Cape Peninsula, known locally as //Hui !Gaeb was greatly impacted upon and after VOC settlement was disrupted and then destroyed. The first emergence of new tribes who settled more permanently on the Cape Peninsula as a result of a split in the Cochouqua (Go//kaukhoena), probably in the 15th century, was the Goringhaiqua (!Uri//aekhoena). The second tribe to emerge as a split from the Goringhaiqua were the Gorachouqua (!Ora//khaukhoena), and both these groups lived and moved about in various locations of the Peninsula from the Liesbeeck to Fish Hoek to Hout Bay. Another offshoot, the Goringhaicona (!Uri//ae/khoena) was made up of drifters and outcasts from all the aforementioned clans and as a clan of around 60, they established themselves, first on Robben Island with the assistance of the English, as a community of traders, and later, on the mainland banks of the Camissa River (//ammi ssa) in Table Bay continuing as a trading community. The Goringhaiqua established their settlement alongside the Camissa River Mouth. Here the indigenes established the foundation village and port operation that would become the City of Cape Town. The Goringhaicona themselves were dubbed ‘Watermen’ by the Dutch. This was about 14 years prior to the European settlement in 1652. New commodities such as skillets, knives, iron, copper, brass, tobacco, clothes, beads and alcohol became available to the Khoena through their trade with the Europeans and skewed the existing the economic values, including the trade in and ownership of livestock, and this introduced new social problems and opportunities. The Khoena also were spurred on to develop new technologies such as salt production where they traded salt to the ships as a prize commodity. Autshumao, (the so-called Herry the Strandlooper)performed his postmaster, trader and port master role ably, was a proficient linguist, was shrewd and astute and, also knew the value of playing off the English and their enemies, the Dutch and French. The Khoena knew to keep their main herds of thousands of cattle and sheep, and their families, far inland away from the Europeans. Autshumao was not simply an opportunist go-between trader but served a defensive buffer role for his people. Regardless of the basic nature of the services provided, he offered post and communications, stevedoring, ship’s chandeliers, and trader services. In the first eight months after van Riebeeck’s arrival, he built a fort right on top of Autshumao’s Camissa village, which had hosted him and his men. Van Riebeeck notes that after he had moved into the fort he could still see the forlorn Autshumao encamped by the river. Within 35 years of the VOC establishing a permanent presence at Camissa, the Cochouqua, Goringhaiqua, Gorachouqua and Goringhaicona were pushed out of the territory of the Cape Peninsula and past the so-called Hottentots Holland Mountains and beyond the Berg River. The Khoena, who originated 2500 years ago on the perimeter of the Kalahari through the mixing of Kalahari San and East African herders who trace back in part to the Niolitic people of North Africa who were sheep farmers, had gone through a long and arduous migratory drift over time. 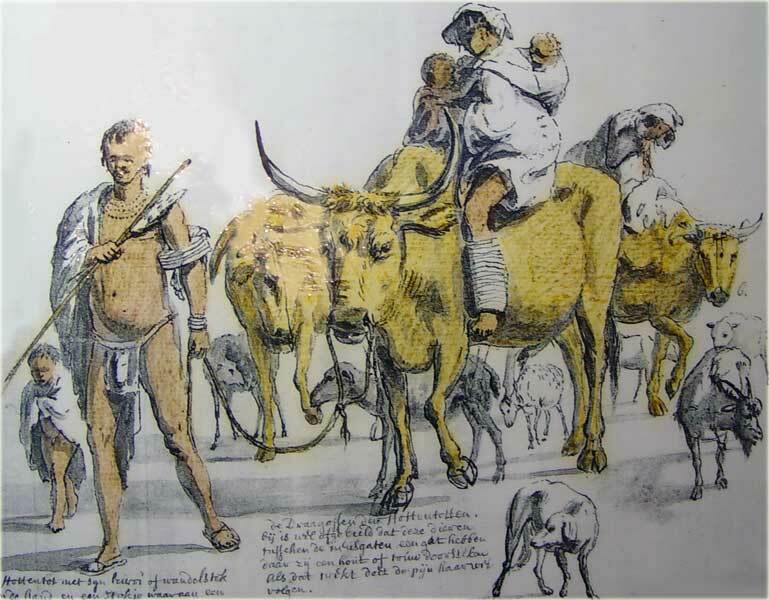 By 300AD they had moved down from the Kalahari to the Gariep where they shared habitat with the Gariep San. Then over the next 800 years they moved into the Eastern Cape and gradually over this time gave birth to one tribe after the other. By the 15th century the first of the Cape Peninsula Khoena groups had emerged from the Cochouqua, – the Goringhaiqua, who in turn had emerged from the Chainouqua. The Chainouqua had emerged to take habitat in the Southern Cape as a sub tribe of the Inqua who in turn had evolved from the Chobuqua who were a mix f the early Khoena from the Gariep and the siNtu earliest migrants from the Great Lakes region whom the San and Khoena called the Xhosa, long before the later Nguni migrations of the 12th and 13th century. The Eastern Cape San and Western Cape San retreated to the mountains and the Central Cape districts as the combined pastoralism of the Khoena and Xhosa impacted on their hunting grounds. By the end of the 16th Century the Goringhaiqua gave birth to the Gorachouqua and by 1630, the Goringhaicona emerged as a result of some drifting away from the Cochouqua, Goringhaiqua and Gorachouqua. By the time that the first European travelers started arriving at Table Bay the Khoena firmly had “FIRST HABITAT” right down to the Cape Peninsula. Van Riebeeck’s VOC settlement brought this all to an end and successive VOC and the British colonial incursion by 1828 had ethnically cleansed the Khoena from most of the Cape forcing them to the Gariep district and turning survovours within the Cape Colony into farm labourers and military conscripts. According to European history the Europeans had been passing through Table Bay since 1488 and according to the Chinese accounts, the Chinese passed through Table Bay in 1421 for the first time. Chinese cartography provides the only map of the time showing clear features of South Africa such as the Drakensberg mountains. From the time of the Chinese voyage around the Cape by Admiral Zheng He in 1421, until 1652 when the first Dutch settlement occurred, there had been two centuries of interaction by the indigene Khoena people with foreign visitors dropping anchor in Table Bay. The story of the visitors and migrants of colour to the Cape, however can possibly be first traced back to the Phoenicians (people of Lebanon, Syria and northern Palestine) 2,500 years ago, followed by the Carthegians 140 years later. An ancient Buddhist temple at Borobudur has a bass relief showing a sailing vessel indicating a trip down the east coast of Africa around AD 700 by Indonesians too. Records further show that the Chinese travelled down the African coast in AD 960 and the Arabs may have reached as far as the Cape in AD 1000 and that their cartography fairly accurately identifies South Africa in 1154. It was the regular visits by the Europeans after 1600 however which first caused an alteration in the nomadic herding habits of some of the Khoena who established the first trading settlement on the banks of the main Camissa river on the shore of Table Bay. It was this act that constituted the foundation of the City of Cape Town and was the root community, or footprint of the Camissa People and their descendants. It was also these Camissa people who first opened their arms to give refuge to runaway slaves and non-conformist Europeans and thus the character of the Goringhaiqua further developed over the years. Over a 200 year period 75 000 slaves were brought to the Cape where they and their offspring lived their lives as slave workers who built the City of Cape Town and its small towns and farms under Dutch and later British overlordship. The slaves came from other parts of Africa, from Madagascar, India, Indonesia and China. Autshumao had first learnt about slaves when he went to Java and he also learnt about the differences amongst the Europeans. He used such information to his advantage. In December 2013 a letter appeared in the Cape Times from academic Keith Gottschalk who respectfully and genuinely inquired as to where the use of the term CAMISSA originates and expressed some skepticism about it being accurate. I have utmost respect for UWC academic and fellow comrade Keith Gottschalk (We Need Evidence, letter to editor of the Cape Times 2 December 2013). I responded respectfully in taking up his request for information on the association of the name ‘Camissa’ with the City of Cape Town. Over a decade earlier when I first came across the usage of ‘Camissa’ by Cyril Hromnick, and its increasing commercial usage in Cape Town, I shared Keith Gottschalk’s skepticism and did a research check. Gottschalk is correct in stating that //Hui !Gais or //Hu !Gaeb is the Khoena term that most would associate with the broader Cape Peninsula where it simply means ‘where clouds gather’. The term //ammi-i-ssa or gamis or kamis or kamma which is the root for ‘Camissa’ is the old indigene language of the Khoena, (or Khoi),and is the term for any fresh or sweet-water river as noted by Portuguese cartographer Lazaro Luis in 1563 on his map as – ‘de Camis’ alongside the name ‘Aguada de Saldanha’ for the same river flowing through Cape Town. In cross-referencing the cartographic reference of Lazaro Luis I also looked at an entry on 24 April 1682 by Governor-General van Goens captured in Moodie’s Record (1959) page 387 which notes the inland Khoena people referring to a fresh-water river as ‘Camissa’ or ‘Cumissa’. In Cape Town the main fresh water tributary – kamis or kamma – that ran from the mountain Hoerikwaggo to the sea was given many names by the Europeans and three of these coincided with that of the indigenes – Camis on Luis’ map, Agua de Saldhana (water of Saldhnana – the original Portuguese name for Table Bay) and Soetwater Rivieren (Sweetwater) – freshwater as distinguishing this from Zouten Rivieren. The first establishment of a refreshment station on the banks of the ‘Camissa’ in Table Bay for passing ships must be attributed to the maroon group of Goringhaicona under Elder-leader Austhumao, having continued this tradition from Elder-leader //Xhore of the Goringhaiqua from 1615 after //Xhore was returned to the Cape, having been kidnapped to England for a year. The notion of a town or settlement before this time did not exist among the Khoena and thus Cape Town per se would not have existed, nor had any town-specific name existed. The Khoena would make for the distant Peninsula seen from the West Coast – the cloud covered Hoerikwaggo, an area they called //Hu !Gaeb. By the early 1600s there were two patterns of abode evident among the indigene Khoena. Some followed a circular migratory pattern associated with climatic changes and herd feeding requirements while other established settled villages of a more permanent nature. Impacts brought about through the huge shipping traffic calling at Table Bay also resulted in a permanent trading settlement being established. Maritime records show that 1071 ships stopped at the Cape of Good Hope between 1600 and 1652, carrying troops and officials of the VOC and other European powers to the East. These ships developed fairly sophisticated service arrangements with the Europeans and a number of indigenes travelled abroad and back to undergo training, learning of language and familiarisation with the needs of the Europeans. The most successful of these, the entrepreneurial Autshumao broke with both the nomadic pattern and the pastoral village tradition when he established himself on the banks of the Camissa and around the Table Bay shore. thanks, this is extremely interesting – from a ‘cape coloured’ now residing in australia. You’re welcome my brother. Read on. Eddie, the Chinese originated in East Africa and were originally dark skinned, the San also trace there bloodlines back to the same origin hence the physical resemblance and that’s about a 100000 years before the Chinese voyages of discovery. The light skinned races are really the new kids on the block with a history that only goes back about 8000 years. Overwhelmed with gratitude and mesmerized by your depth, detail and clarity I thank you from the soul of my heart.